Almonds are a rich source of nutrients including Vitamin E, Manganese, Biotin and Copper. One of the best reasons to enjoy eating almonds is because they can reduce cholesterol levels, but they also contain other vital health benefits such as being a rich source of unsaturated fatty acids, fiber, along with unique and protective phytosterol antioxidants and plant protein. For all of these reasons, eating more almonds is highly recommended as part of a healthy and nutritious diet. Paleo Pumpkin Muffins – These delicious muffins made from almond flour are a rich source of nutrients along with various vitamins and minerals. Pumpkin is an excellent source of dietary fiber and monounsaturated fats that are good for heart health. Pumpkin seeds are also an excellent concentrated source of protein. Get the recipe here. Roasted Butternut Squash with Kale and Almond ‘Pecan’ Cheese – This is a hearty and healthy meal that’s full of flavour and rich in various nutrients. Butternut squash is a good source of Vitamin E, Thiamin, Niacin and Vitamin B6. Get the full recipe here. Chocolate Brownie Bites – Combining raw almonds, cocoa powder and Medjool dates, these brownie bites make for a deliciously nutritious chocolatey treat whenever you want to indulge. Get the full recipe here. Homemade Muesli – This is a fiber rich muesli that contains Buckwheat flakes, mixed dried fruits, flaked almonds and chopped nuts. Find out how to make this simple. Get the recipe here. Fish with Saffron-Tomato Quinoa – Flaked almonds add a rich and nutty taste to this saffron and tomato infused fish dish, making it a good source of protein, niacin, phosphorus and selenium amongst other nutrients. Get the recipe here. 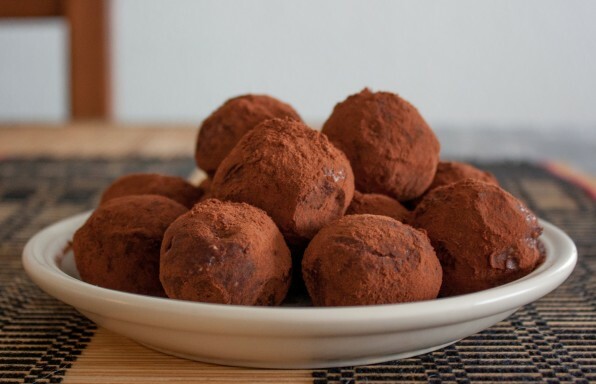 This recipe makes about 16-18 truffles.